You know, we were going to say how Ocean Master is a terrible choice for this line (especially when we're still waiting for Ice), but Aquaman only has two enemies total, and they made the other one five years ago. Sibling rivalries are never easy, especially when the sibling in question is a member of the Justice League. Throughout his career, Ocean Master's deepest desire has been to steal the throne of Atlantis from his half-brother, Aquaman. Although this never-ending struggle has taken a toll on Ocean Master's sanity, he eventually succeeded in capturing a number of Atlantean outcroppings. Unfortunately, the poweful trident that enabled this feat came with a heavy price tag - his soul. When he first appeared, Ocean Master was Orm Marius, and he was 100% human (Aquaman's human daddy did the bad thing with a mer-lady, then later with a human lady). Post-Crisis Aquaman didn't have a human father, so now Ocean Master had to be ethnically half-Atlantean. This trend of bumping his fishiness up by half in every reboot continued in the New 52, where Aquaman is back to having a human father, and Orm is now his half-brother on their mother's side. Ocean Master has worn a lot of minor variations on the same monstrously stupid costume over the years, and this particular take on it seems to come from the '90s Aquaman comic (circa issue 66). The biggest give-away as to its origins? The mask. While Ocean Master's masks always have the stupid cheek-frills, 99.44% of them also cover his nose; the only ones that didn't were in Flashpoint and the previously mentioned issues. And now captured forever in plastic on this toy. 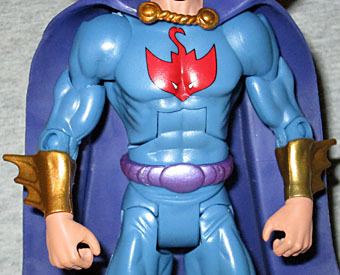 Fittingly, the toy's costume seems to be a blend of those two sources: like the Aquaman #66 version, it has bare hands, no boots, and a red stingray symbol on his chest without a white circle behind it; like Flashpoint Orm, he has a ridged belt, and there are fins coming off his bracers. Naturally, he's wearing a cape that even Spawn would find excessive, because nothing says "freedom of mobility underwater" like attaching a heavy piece of cloth directly to your own throat. Orm comes with his trident, though the points have all been rounded off to a ridiculous amount. This is supposed to be an adult collectible, right? And that means it doesn't have to meet child safety regulations? We should be able to cut ourselves on his trident! That bit in the bio about it costing his soul? It's a reference to the Underworld Unleashed crossover, where he was one of the villains to get a power upgrade from the demon Neron: the downside of the trade was that he experienced intense physical pain whenever he wasn't holding the weapon. Wow, Ocean Master is so boring that we almost forgot to tell you about the Mike Thompson portrait on the back of the box! The costume shown back here is the same melange of versions that the toy wears, but the art gives him the advantage of pointed fins coming off his calves, like the various Aquaman toys have had. That would have been neat. His helmet appears to have a chin strap back here, which looks more protective than the toy's mask. He's standing ankle-deep in flowing water, and there are a few small pieces of sealife on the rock his foot rests upon. Ocean Master is fated to forever be "the 'lame' Aquaman villain," which is kind of like being "the 'ugly' member of Steely Dan." 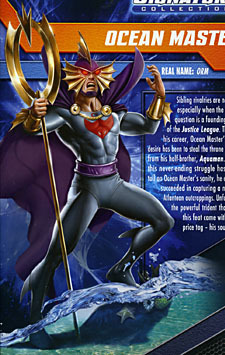 Even in a year that gave us Cool Disco Dad, a French monkey and the Red Hood nobody wanted, Ocean Master seems like a character released way too soon. 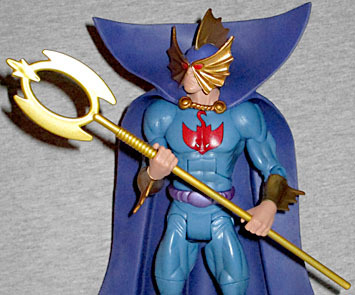 DC Direct has been making toys since 1998, and they got around to Ocean Master in 2009. That seems fair. 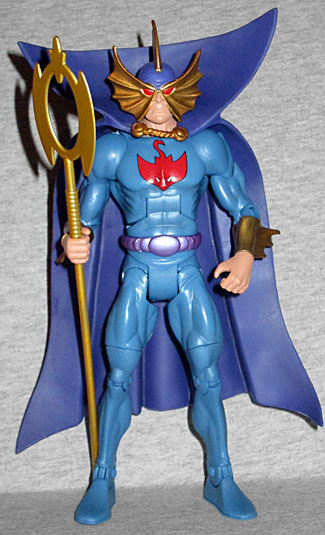 There's nothing wrong with this figure, really, it's just... who gives a crap about Ocean Master? 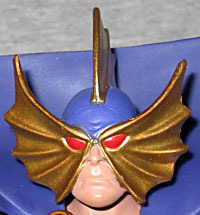 There are probably more people who would spend money on a non-sensical Ambush Bug/Bat Lash two-pack than there are people who want Ocean Master.